The NSO has spoken at length to Amrik Singh Chandigarh who shared a full and detailed account of the background to the violent attack against him, which we understand is currently under investigation by police authorities. It is simply appalling that the victim of an unprovoked assault, is being blamed by some for shameful violence at Singh Sabha Gurdwara Southall earlier this week. Last weekend Amrik Singh [pictured], a well-respected preacher from India was invited to speak at Gurdwara Singh Sabha Slough and his exposition of Gurbani was well received there. He was then invited to Singh Sabha Southall. His preaching urges us to respect the teachings of the Gurus and the Guru Granth Sahib and not to follow false gurus and sects. His uncompromising stance on the primacy of Guru Granth Sahib upset a gang of known hooligans from Tividale gurdwara in the Midlands. The gang owe allegiance to the so-called Dasam Granth in its entirety; despite the fact that it was compiled by non-Sikhs and much of its contents extol the exploits of Hindu gods and goddesses. This is not the first time that this sect has resorted to physical violence against those that reject their distortion of our Gurus’ teachings. Another Sikh, beaten up by them a few years back, still walks with a limp. Unfortunately, some members of the Managing Committee in Southall belong to this sect. When they got to know of the invitation, they alerted the thugs who turned up at the gurdwara determined to stop Amrik Singh speaking. 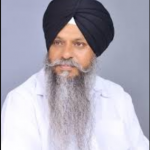 In an attempt to diffuse the situation, the President, Gurmel Singh Mahli, invited the sect members and Amrik Singh to join him in a committee room to sort out their differences. The assault on Amrik Singh took place as they were on their way to the meeting room. Unfortunately, the President then decided to take the side of the sect and asked Amrik Singh (who had not spoken a word) to apologise or he would be barred from speaking in any UK gurdwara. Knocking off Amrik Singh’s turban undoubtedly hurt his sense of dignity and self-esteem and his physical injuries will last longer. In offering this visitor to the UK our sympathy and support, we should also look at and take action on the following underlying issues. Members of a gurdwara managing committee must commit themselves to following our Guru’s hukam to be true to the teachings of the Guru Granth Sahib and not those of any other cult or sect. Violence of any sort in a gurdwara should be reported to the police and perpetrators and their supporters should be barred until they give the sangat a public apology for their behaviour. Gurdwaras should only be places for the preaching of Sikhism. Those that want to preach distortions, however sincerely held, should do so in separate places of worship. The NSO requests the Sikh Council, the Sikh Federation, City Sikhs and other Sikh groupings to join with us in condemning both the actions of the hooligans from Midlands, and the dereliction of duty of the management of Singh Sabha Southall for allowing its premises to be used as venue for anti-Sikh behaviour. A prompt condemnation of the Takhsali bully boys will speak volumes. So also will silence.